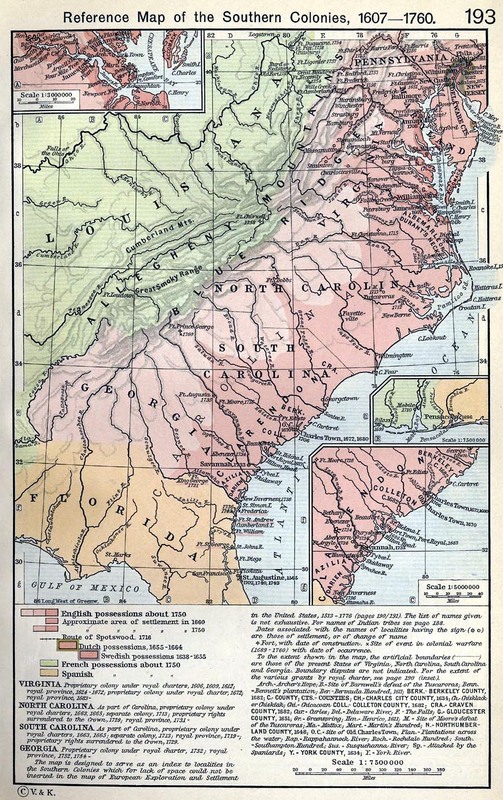 Georgia was the last of the thirteen colonies to be established. This war partially due to the hot can humid weather which inhibited the growth of crops that Englishmen were familiar with and also due to the proximity to the Spanish claims in Florida. This made protection and defence an issue. Disease was also a factor as malaria, swamp fever and other maladies made this Southern destination an unhealthy one for a Northern European. However over time colonists in Virginia and the Carolinas and even the Caribbean experimented with more suitable crops like cotton, coffee, rice and sugar for these warmer climes. Labour (and health) issues were also solved by the use of slavery. 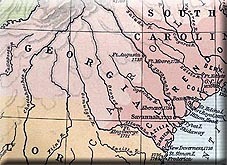 In fact, the Caribbean plantations were much more the model of development for Georgia than the more Northerly American colonies. In 1733, James Oglethorpe was awarded the right to establish a proprietary colony by George II. Hence the name of Georgia. The reasons for settling this colony at this time were numerous. 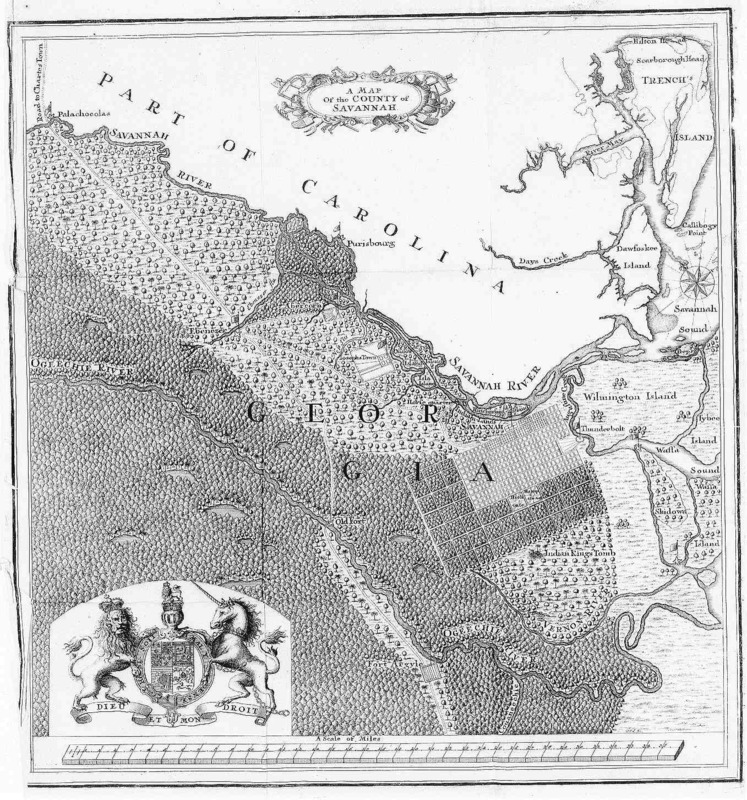 The British government was keen to develop a strong buffer zone to protect the Carolinas from the Spanish in Florida and James Oglethorpe was an experienced Army officer. Oglethorpe had other motives too. As a result of his campaigning in Europe he had been moved by the plight of Protestant refugees and victims of French and Spanish wars. He therefore wanted to establish a colony for Protestant refugees. For this, and the anti-Spanich buffer zone reason, Freedom of religious expression did not extend to Catholics in Georgia. Oglethorpe had also been an MP back in England and had been moved by the plight of debtors in the infamous debtors prisons; especially in the wake of the infamous South Sea Bubble fiasco. He therefore wanted to establish a colony that would give people like these a second chance. Georgia therefore allowed the use of indentured servants whereby English criminals (usually debtors) had the choice of working in Georgia for a sentence of somewhere in the region of seven years instead of being punished back in England. It was a form of redemptive slavery and allowed Georgia to achieve a steady supply of enforced colonists. Of course, slaves from West Africa were an even more steady supply of enforced colonists and these were chattel slaves who usually did not have the ability to gain their freedom. Although some chattel slaves could and did earn their freedom. Georgia was an expensive colony to run - mainly due to the defence costs associated with guarding the Southern flank against the Spanish. The proprietors had always needed to receive a large subsidy in order to keep their finances afloat. However in 1752, Parliament voted against extending these subsidies with the result that the proprietors pulled out of the colony. This meant that the Crown had to take direct control of the colony and so ended up paying all the administrative costs after all.